Brand New Interior Finishes Available! White Quartz Countertops, Gray Subway Tile Backsplash, White Shaker Cabinets, and Whirlpool Stainless Steel Appliances! Come home to the best Chula Vista apartments at Camden Sierra at Otay Ranch, just outside sunny San Diego. Our exclusive suburban apartment community, located within the pedestrian-friendly planned neighborhood of Otay Ranch, has spacious one, two and three bedroom apartment floor plans available for you to choose from. And, our large, three bedroom townhomes with attached garages are all you need to entertain or even work from home. Camden Sierra at Otay Ranch offers newly renovated interiors with Whirlpool stainless steel appliances, wood-style flooring in kitchen and bathrooms, brand new white quartz countertops, white shaker cabinets, and gray subway tile backsplash. Our open-concept floor plans have ample cooking space, large walk-in closets, plus washers and dryers in every apartment home, as well as private patios. Say goodbye to your gym membership. Camden Sierra at Otay Ranch offers a 24-hour fitness center with full cardio and free weights for your entire workout needs. Having friends over? Head to the resort-style pool for a day of fun and grill outside at our outdoor grilling stations. Have pets? No worries! Camden Sierra at Otay Ranch is a pet-friendly apartment community with several pet stations throughout for your convenience. We even have an onsite playground for the kiddos to have fun after walking home from the nearby schools! Located in a beautifully designed suburb near San Diego, Camden Sierra at Otay Ranch apartments are only a few miles from shopping and entertainment. Check out Otay Ranch Town Center, where you can shop, dine, hang out with family or friends and unwind after a long week. 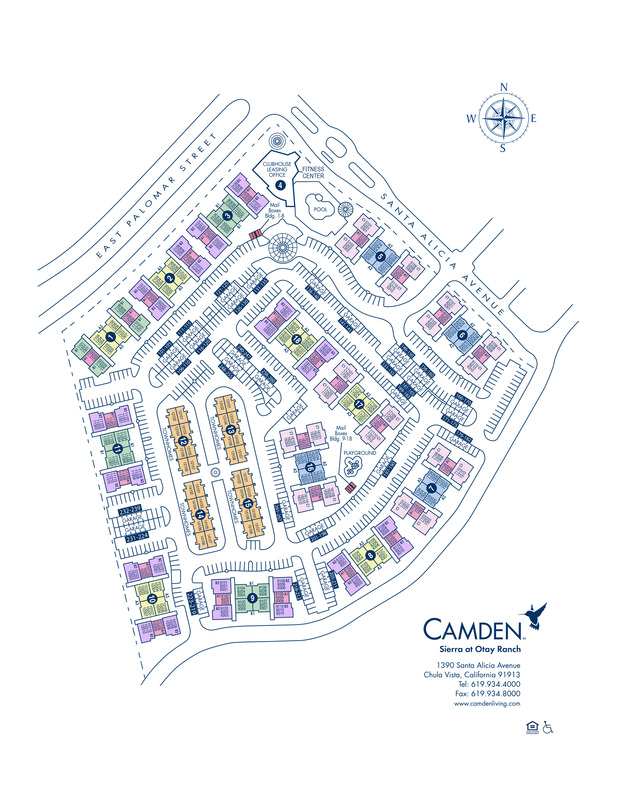 Camden Sierra at Otay Ranch is minutes away from parks complete with hiking and biking trails. Located only an 8 mile drive to Sea World and 9 miles to the San Diego Zoo, you will be glad you chose Camden Sierra at Otay Ranch as your new home. Plus, Camden Sierra at Otay Ranch is conveniently located near the 805 FWY, which means your daily commute is that much easier. The good life is waiting for you. Come home to Camden Sierra at Otay Ranch. At Camden, your pets are family too! We welcome cats and dogs, up to two pets per apartment home. Call us with any pet-related questions! We currently allow large dogs on the first floor only. Please see management for pet approval. Get the perfect spot! We have ample open parking for our residents, up to two per apartment home, and visitors on a first-come, first-served basis. Attached garages are included with select apartment homes. Detached garages are available to rent for $90 per month.